Therefore, after so many weeks of living on an unregulated schedule it was very difficult to come back to the city of Prague in which I live and work. Yes, even the enchanting streets of Old Town and the sight of the Prague Castle can be a bit tiresome. However, while I was away, plenty of developments were happening on the banks of the river. My first Saturday back in town was a particularly hot and humid August day. Dressed in a light sundress and flip-flops, my hubby and I went out for a walk. 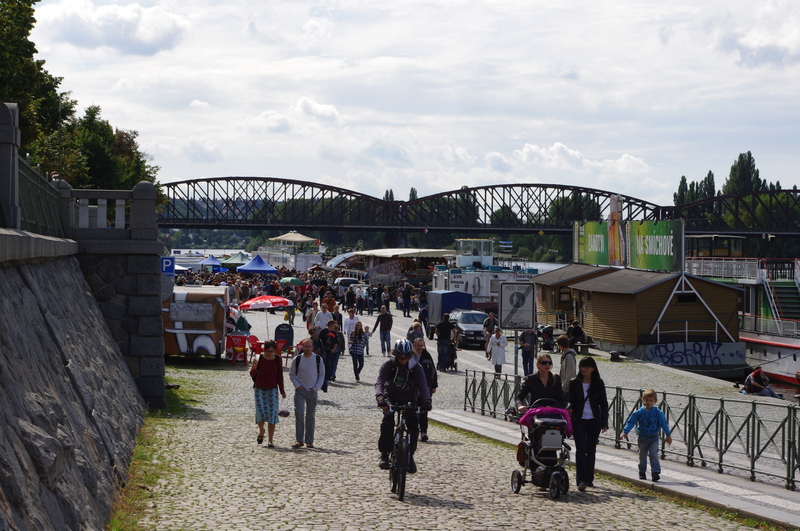 Just two blocks away from our home is the Vltava River and as we were crossing the Palackého bridge, we spotted a number of tents lined up along the river bank and crowds of people strolling along the cobble stoned path. As we got closer, we saw a banner printed with the words “Farmarsky Trh” It was a farmer’s market!!! A FARMER’S MARKET!!! Unfortunately, we caught the tail end of it and only a few stands still had products for sale. I would have to wait another week to get the full experience. The following Saturday, I was all set with my honey brown straw basket and wallet full of Czech crowns to do some serious farmer’s market shopping and I was not disappointed. 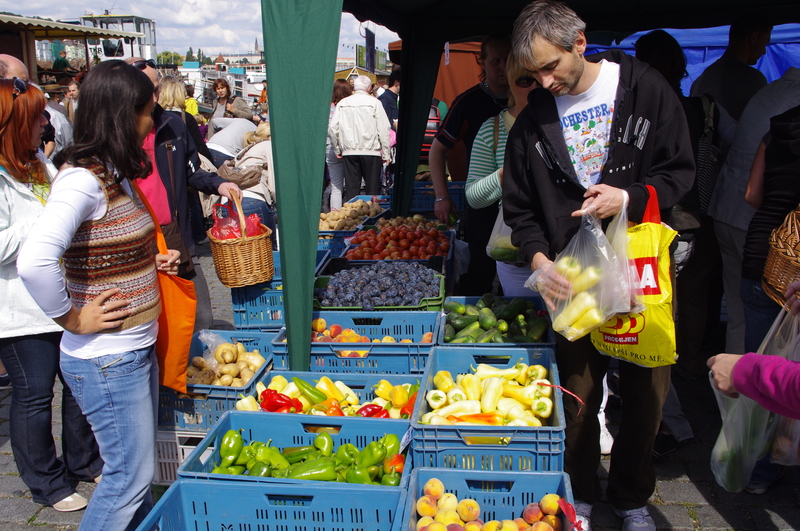 There were a number of fruit and vegetable stands selling the usual staples: cucumbers, potatoes, peppers and tomatoes. Also on display were some seasonal fruits such as plums, peaches and berries. 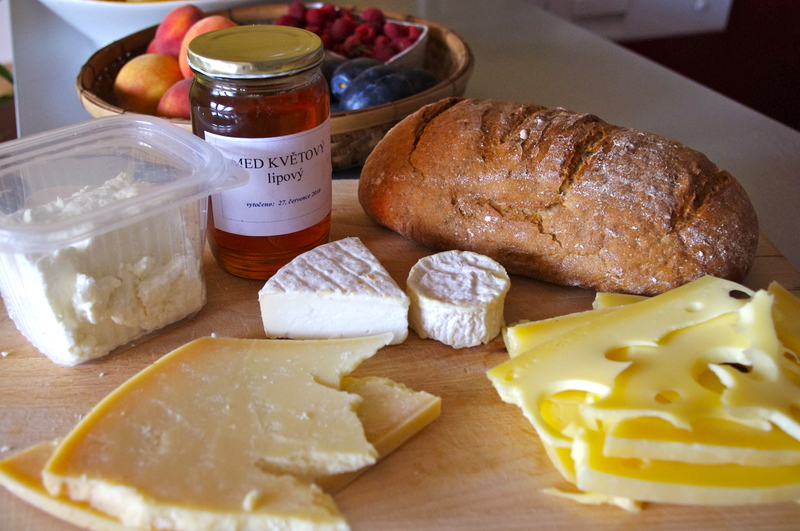 Different varieties of homemade cheese such as tvaroh, bryndza and some made from goat, could be sampled before purchasing. 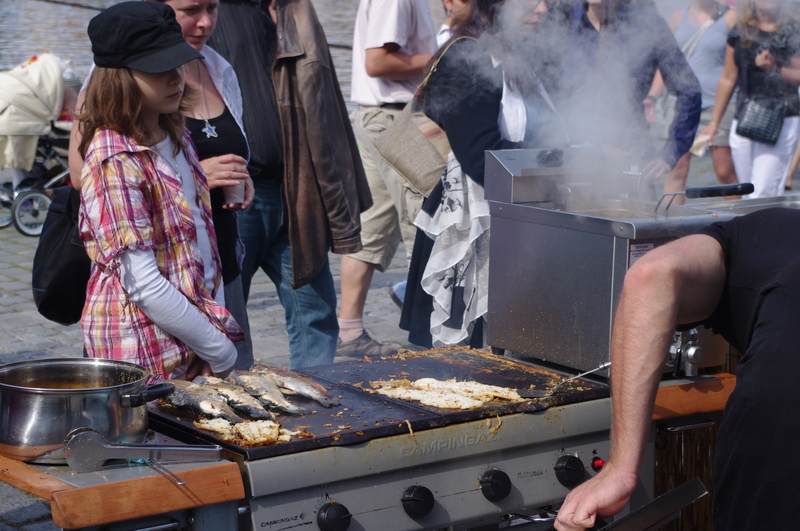 In addition, there were smoked meats, bread, honey and local wine also available to take home. 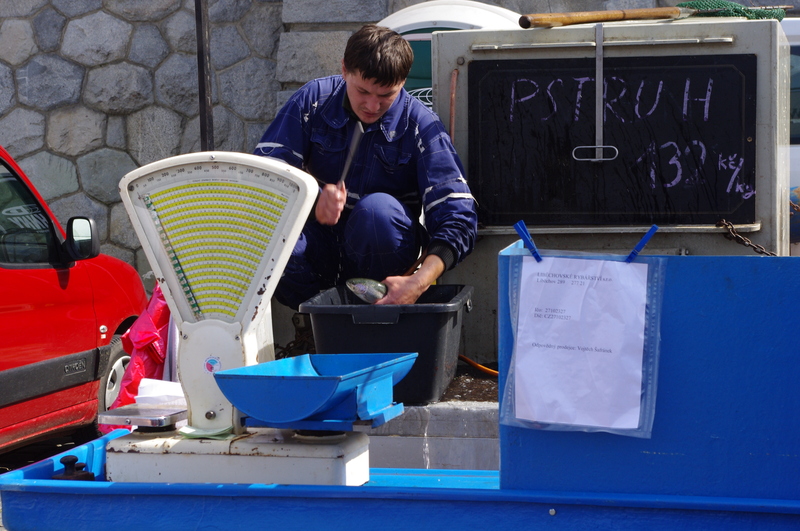 There were two stalls that completely surprised us, one selling fresh trout and another selling grilled fish sandwiches! Grilled Fish Sandwich? Just 60 crowns! I happily returned home with our local items and I couldn’t wait to get something on the table for us to snack on. The most exciting purchase was my bag of peaches which is one of my favorite summer fruits. I had a great supply of them during my visit to Nashville, TN. where, I also discovered a delicious new way to eat them, courtesy of the brunch menu at Marché Artisan Foods. 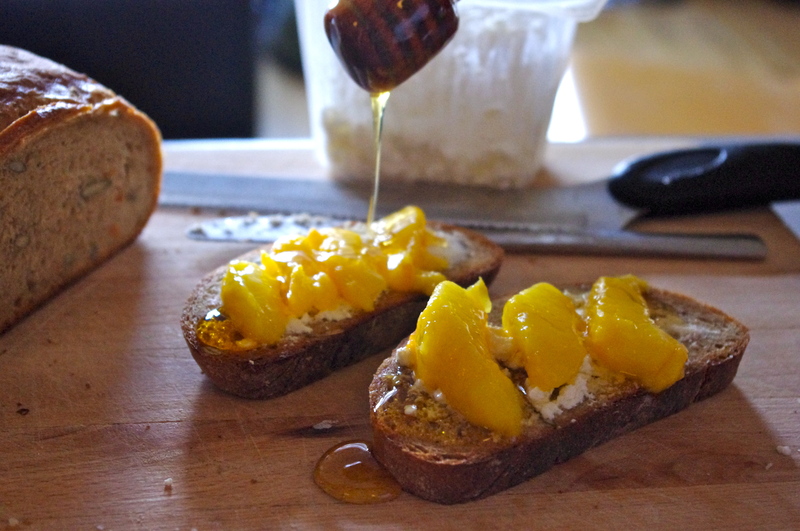 This simple, yet sweet meal, consisted of toasted whole wheat bread with ricotta spread on top, then layered with fresh ripe peaches and finally a drizzle of honey on top. Delicious! Sad to say but a fresh tub of ricotta cheese was not sitting in our basket. Instead, I thought I could substitute ricotta with the plastic container of homemade farmer’s tvaroh cheese that I just bought. What is tvaroh cheese, you might ask? Well, it is slightly like ricotta and cottage cheese. Ricotta differs because it is made from whey (the leftover milky stuff after it has been curdled and strained) and although tvaroh is a curd type cheese, it is not as watery as the cottage cheese we buy at supermarkets. I like to think of tvaroh as a thicker version of cream cheese but without the sweetness. It’s very low in fat too, just in case you are counting calories. I attempted to recreate the Marché Artisan dish using the local products from the market. The result was just as lusciously sweet, and I was especially satisfied because each item on our plates came from one of our local farms. I had a peachy homecoming after all! Lightly pan fry them in a neutral oil. Add brown sugar and gently toss them around in the pan for a minute or two. Spread cheese over the slices of bread. Lay peaches flat on top of cheese. Then drizzle honey over the peaches and cheese combo. Filed under Flavors Abroad!, Prague Inspires!